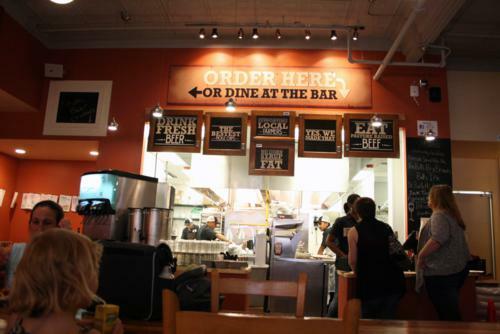 This order-at-the-counter joint is a great setting for an after work meal and drink with friends. The long picnic tables are very appealing for a large group, and the atmosphere is nicely relaxed and neighborly. I quite liked the bar’s design, too. All of the wood has been repurposed from old barns, wood shops, and other materials. I haven’t been outside yet, but I hear the porch, which borders Dos Perros’s porch, is lovely. It appears the two restaurants are getting musicians outside on some evenings, as well. Jump in line right away, and take a look at the daily specials in the little window outside the brewery proper. 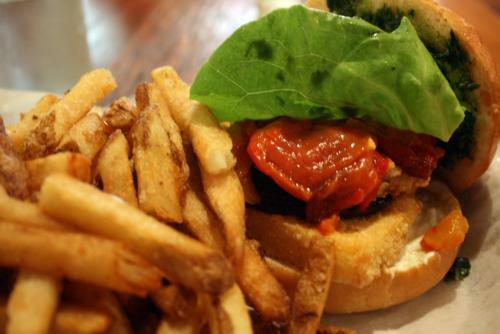 Nearly everything BCBB serves is made in-house and the bread, meat, and vegetables are all sourced from North Carolina. On that specials menu, you’ll find the pickled vegetable of the day in addition to a changing vegetarian offering called the market special. Be forewarned, though, that it doesn’t say it’s vegetarian on the list—my friend and I both thought we were getting a patty with fancy toppings when we ordered it on our first trip! 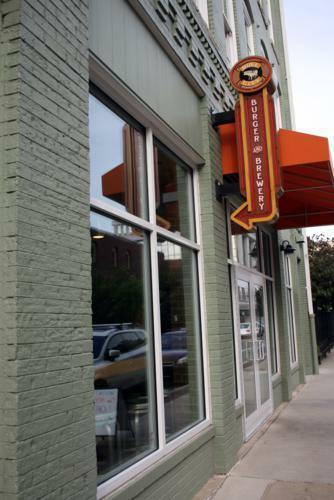 After you place your order, don’t forget to read the Durham trivia that comes along with your order number! It’s a cute touch to offer a different trivia item for each year that the order numbers stand for. 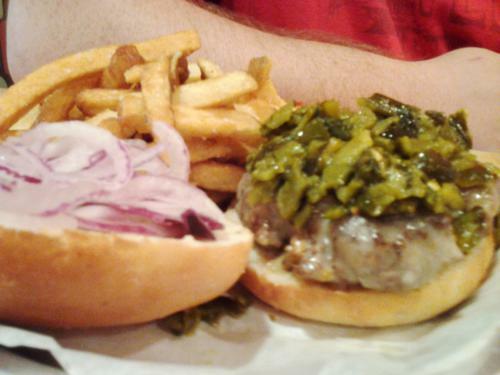 BCBB mainly offers customizable burgers (there are a few specialty ones, too), hot dogs, and chili. They have a range of beers brewed in-house and an exciting cocktail list. 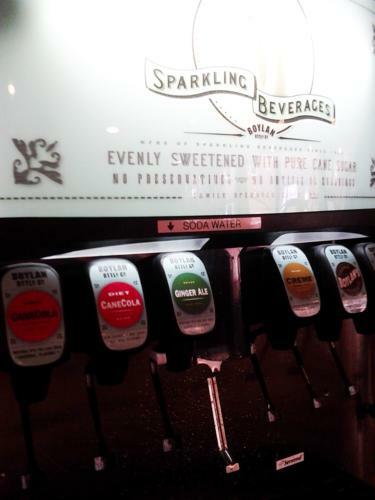 Of special beverage note is the Boylan Bottling Co. soda fountain, not something you see every day, full of flavors like birch beer, cream soda, and cane cola. Its presence is the result of BCBB’s choice to not offer anything featuring corn syrup. I, however, opted against soda this time, choosing the Braggstown Punch ($5) instead. 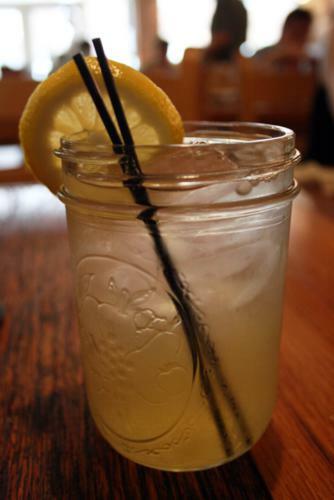 Made with bourbon, lemonade, and a soda splash, it was a mellow, refreshing choice for a summer evening. The lemon ring made for a striking presentation. Now back to that market special that I didn’t realize wasn’t a burger. It was delicious. The thick wedge of deep-fried creamy polenta mixed with fresh lemon ricotta was a perfect example of what melt-in-your-mouth means. The thin schmear of pesto and roasted red peppers were flavors that contrasted wonderfully with the polenta. Charred red onions and fried green tomatoes also joined the party. I harbored no disappoint over the lack of meat at all. The bun was good, if nowhere near as impressive as the sandwich toppings. I chose dirty fries, meaning fried with the skin on, over their well-loved duck frites that are finished in duck fat and tossed with rosemary and Fleur de Sel. I just don’t like skinny fries as much as other varieties of potato. The dirty fries were good. One of my fellow diners tried out the griddled lemon pound cake for dessert and was nice enough to give me a taste. Oh my word, that’s good. 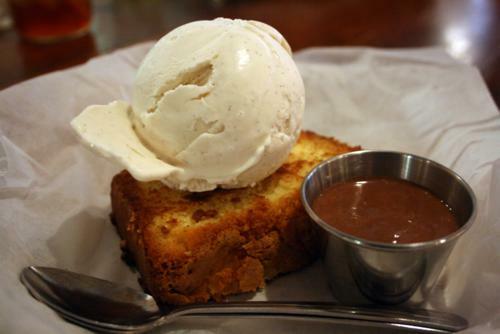 The pound cake is indeed warmed up on the griddle, then it’s topped with vanilla bean ice cream and served with a spicy chocolate sauce. The sauce definitely tasted like it had some sort of berry flavor, too, and it was so interesting to eat. I highly recommend this dessert—it’s the only one on the menu, so it won’t be hard to remember! Of course, because I neglected to actually have a burger at a place with burger in its name, I had to go back to BCBB a second time. 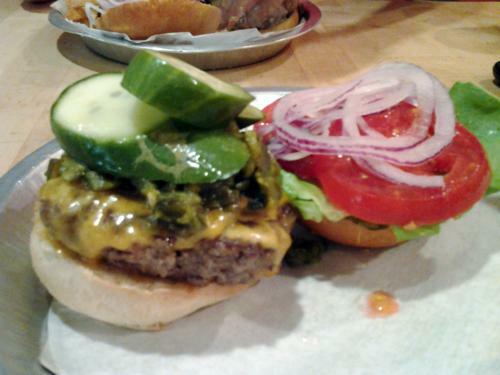 My husband had the Green Monster ($8), which comes with gruyere, onion, and roasted poblano peppers. Oh, look, it’s at this point in my blogging that I lost my camera! Wow, it’s easy to see the quality drop from SLR to camera phone. I’ve got a new camera ordered finally, but the blog still won’t have as frequent updates for a while. But back to the burgers! I decided to customize mine and chose to add cheddar cheese, roasted chiles, and the pickle of the day, cucumbers, for $1 each. Items like lettuce, onion, tomato, pickles, and a variety of condiments that I look forward to working my way through are included in the base burger price. Now my only real complaint about BCBB is that those topping prices should probably be cut in half–$1 each for a slice of cheese, a scoop of peppers, and three cucumber slices is a bit steep. That’s why I think getting a specialty burger like my husband did is a better deal—an extra topping or two for your money. Now if you don’t want to add much, and you certainly don’t need to with all the included toppings, then I think $6 for a burger is totally reasonable. I thought the meat tasted great though it could use a little more imagination with seasoning. And my bun didn’t fall apart, hooray! I hate wimpy buns. 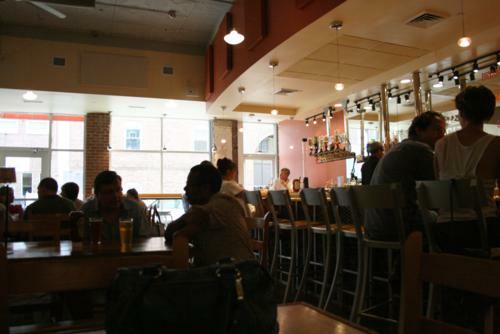 I think Bull City Burger and Brewery is an excellent choice for a good burger and a drink to wash it down with. I’ll be back, likely many, many times. I’m glad that you had two great experiences at BCBB. I’ve heard both good and bad, and my experience there wasn’t so great. My burger was good, not out-of-this-world, but pretty good. When I’ve paid almost $20 for a burger, fries, and a beer though I kind of expect it to be awesome. Additionally, the bun was terrible. Seth told us that they had problems proofing their dough that day, and I appreciated his honesty, but in my opinion they should not have served a product that they couldn’t stand behind 100%. I really appreciate that they make their buns in house, but in that case they could have bought delicious (and local) buns from 9th St. Bakery to get them through the day. I will say that I went very soon after their opening, and I don’t believe its fair to judge a place during their first few weeks of operation. I’ve heard amazing things about their hot dogs, and I’ve yet to try any of their in-house brews, so hopefully I can get back soon and give them another chance. I usually do the opposite of many food enthusiasts and avoid the new spots until a few months after they open–it’s just my personal brand of foodie rebellion, plus, I think I can get a better grasp of how well the restaurant works with more time under their belt. I agree that the bread is the least impressive part of the burger, though, but it certainly wasn’t terrible. If you give them another shot, I’d love to know if you think the bread’s improved!